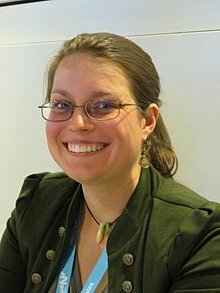 Becky Chambers (born 1985) is an American science fiction writer, who is the author of the Wayfarers series. Chambers worked in theater management and as a freelance writer before self publishing her first novel, The Long Way to a Small, Angry Planet, in 2014 after successfully raising funds on Kickstarter. The novel was re-published by Hodder & Stoughton and it was followed by a sequel, A Closed and Common Orbit, in 2016. The novels take place in a fictional universe, governed by the Galactic Commons. The third installment, called Record of a Spaceborn Few, was published in July 2018. Chambers was born in 1985 in Southern California and grew up outside Los Angeles. She moved to San Francisco to study theater arts at the University of San Francisco. She has lived in Iceland and Scotland before returning to California, where she currently resides with her wife; she identifies as gay. ^ a b c d "Becky Chambers: To Be Spaceborn". Locus Magazine. December 17, 2018. Retrieved December 31, 2018. ^ "The Long Way to a Small, Angry Planet". Kickstarter. Retrieved May 31, 2018. ^ Liptak, Andrew (September 12, 2015). "The Long Way To A Small Angry Planet Is This Year's Most Delightful Space Opera". Io9. Retrieved July 19, 2018. ^ "Becky Chambers". HarperCollins. Retrieved May 30, 2018. ^ Favreau, Alyssa (August 1, 2016). "Interview: Becky Chambers on The Long Way to a Small, Angry Planet & Writing Welcoming Science Fiction". The Mary Sue. Retrieved December 3, 2018. This American novelist article is a stub. You can help Wikipedia by expanding it. This page was last edited on 4 March 2019, at 04:34 (UTC).